We booked a family holiday to Turkey late last year and October 2018 felt like a lifetime away. But before we knew it, October was upon us and we were packing ready for our next family adventure. Included in our suitcases were some pretty impressive snorkelling kits gifted to us by simplyscuba.com. 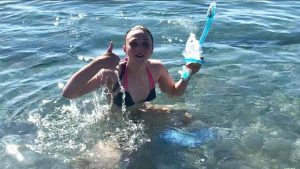 I blogged back in April about our mixed feelings on our first snorkelling experience. Andrew is a daredevil, as is his daughter Bea followed in third place by Harrison who is happy to give things a go but isn’t quite a fearless as his big sister. Oliver is riddled with anxiety and I knew that he would take some persuading to have a go and Harry is autistic so I wondered how he would cope from a sensory perspective. And then there’s me. 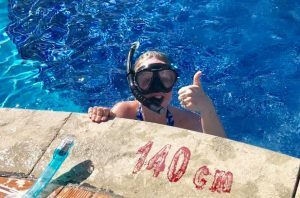 I’m the sort of person that holds their breath when watching diving on the TV so wasn’t convinced that I would be throwing myself into the experience but off we headed to Turkey with loaded suitcases and open minds. 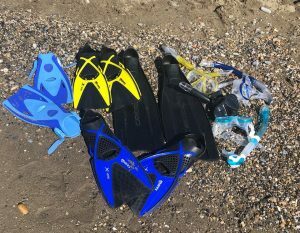 Our kits comprised of flippers (or fins as they are professionally known as), masks and snorkelling tubes (just called a snorkel) We had different colours for the children and Andrew and I had different sized fins but the same masks. We spent some time practicing using the kits in the pool. I’m not sure that this would usually be allowed but we were at the resort towards the end of the season and the huge pool was pretty much our own so we made the most of the opportunity to get to grips with putting the kit on, using it and breathing properly. 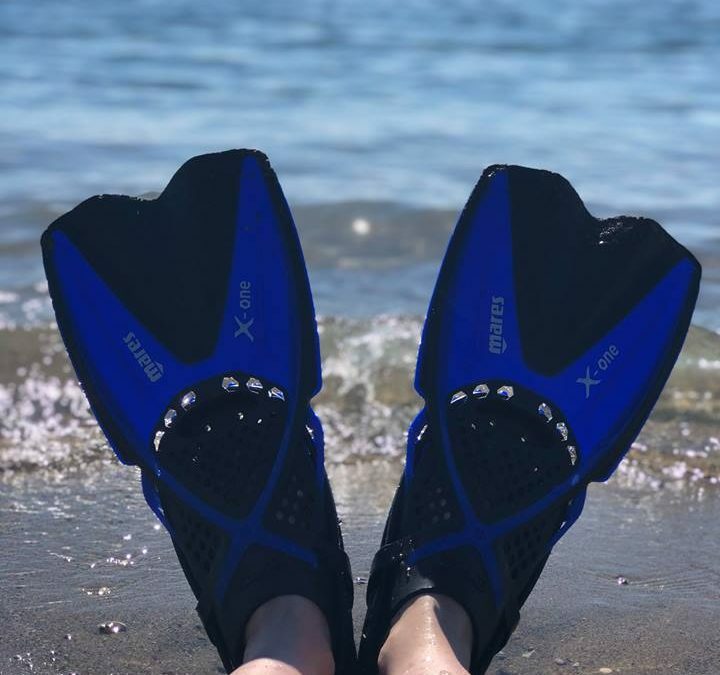 To be fair, the fins were easy enough as you simply kick but the snorkel, for me at least, took a bit of getting used to and so I think some practice time in the pool was a great idea as I could take it at my own pace and stand up if I needed to. Check out our video of my initial hilarious attempts and my step-children who totally showed me up! As predicted, Andrew loved it and was in his element. When he came back to shore from his ocean exploration with Harrison he was elated in describing how he had seen a beautiful school of fish up close who had gracefully parted before his very eyes and swam away serenely. The awe and wonder of the moment really struck him and he’s not keen to go snorkelling and even scuba diving again in the future. Harrison also enjoyed it. He was in the freezing swimming pool daily for up to an hour at a time simply swimming and enjoying the peace and rainbow colours of the pool floor as the light bounced around. We are actually looking into a scuba lesson for Harrison having seen what a natural he was and how much he enjoyed the experience. It was amazing to see him swimming in the ocean so far out with his Dad and he was equally impressed by the underwater world he had seen for the first time. Bea, as I expected was also fantastic. A real natural in the water, I loved watching her ‘mermaid swim’ in the pool and it was lovely to see her exploring the seabed as she came to shore at the beach. She had used fins before at a local swimming club but said that the ones we were using on holiday were much easier to put on and far more comfortable. 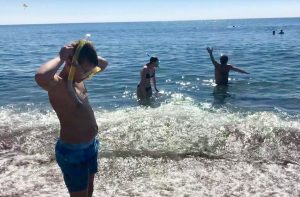 Now for my boys…well, Harry simply wouldn’t tolerate the mask near him and although he ventured into the tepid ocean water there wasn’t a cat in hells chance of getting him the freezing swimming pool. This did mean that I wasn’t able to swim with Andrew at all as one of us had to be with Harry at all times but it didn’t stop us from enjoying the experience individually. Oliver enjoyed the fins but struggled with the mask. He couldn’t calm and coordinate his breathing well enough to swim wearing the mask but he did have a really good try so I was proud of him for that. Having seen him panic, I did wonder how I would feel but I actually really loved it! It took me a few attempts to find the right swimming position as I was instinctively swimming too low which filled the snorkel and made me choke (before laughing my head off!) but after some brief perseverance, I managed to get the hang of it. I loved the peace of being below the water and the fact that I could see what was going on and wave at Harrison and Bea below the water was so much fun. It’s also mega exercise and I could definitely feel it in my legs after 30 minutes of furious kicking around the pool. Sadly, on the day we visited the beach, Harry insisted that I stayed with him so I didn’t get to experience life under the sea but we are looking forward to using the kit again when we go away as a couple. I think the next holiday we have will be our honeymoon so we are adding ‘great places to snorkel’ on the list of requirements for the destination. All in all, a brilliant experience with a genuinely fantastic kit which has inspired at least half of our merry gang to do it again! Huge thanks to simply scuba for the opportunity and adventure.